' ' Cinema Romantico: Where Have You Gone, Madeleine Stowe? Where Have You Gone, Madeleine Stowe? The passages still resonate with me, still put a lump in my throat, even though I have seen them at the absolute minimum 377 times. It's "Last of the Mohicans" and our plethora of main characters are hiking beside a rushing river and Duncan (Steven Waddington), the British officer, wants to know why Hawkeye (Daniel Day Lewis) is headed west when "there is a war on" and all the "colonial scouts (are supposed to be) in the militia." Hawkeye replies: "I ain't your scout. And I sure ain't no damn militia." 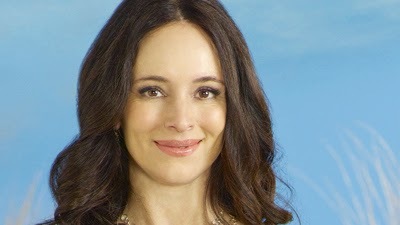 The camera registers Duncan's dubious reaction but the doesn't end there, and instead quickly pans left to the face of Cora Munro (Madeleine Stowe), lingering for a split second. She's not quite as dubious. She's pensive. Next we're at an isolated cabin where all the inhabitants have been viciously slaughtered by an indian war party. Duncan says they should "look after" the bodies. But Hawkeye and his brother and father advise to leave the bodies where they are and march off toward the woods. Cora objects. Hawkeye ignores her. She objects again: "I have seen the face of war before, sir, but never war made on women and children. And almost as cruel as your indifference." Hawkeye stops. He turns. He marches right at her. (And forget all of that physcotic over-acting he does in "There Will Be Blood", okay? Toss all of that out the window. This - this moment when he marches right at Madeleine Stowe with that defiant expression is the most terrifying moment in the whole Day Lewis canon.) "Miss Munro," he says, "they're not strangers. And they stay as they lay." Now notice Cora's reaction. She backs up, yes, and her body language wavers just a bit, but her gaze never relents from his eyes. Not once. What would you do if he came striding at you with that look? Tuck tail and run, that's what you'd do. It's what I'd do. It is not, however, what Cora does. 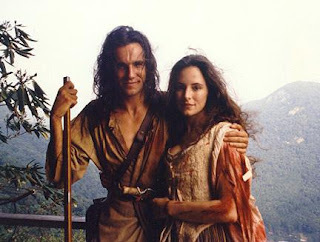 Recently I caught an hour long special on the Reelz Channel, filmed several years ago, in regards to the ouvre of Michael Mann, the director of "Last of the Mohicans", and they interviewed Madeleine Stowe in relation to her role. But the words that stuck with me the most were these from Mann: "Daniel and I met with a lot of women and within ten minutes of Madeleine walking in the door he and I looked at each other and our eyes connected and we knew she was it. They are where great actors go. They are totally in the moment. They are in 1757. Death is tomorrow morning." To truly be in the moment with someone as great as Daniel Day Lewis is not easy. The man is a force of nature. If you don't bring it, you will get swept away. Madeleine Stowe brought it. It was a most immense accomplishment. It's a performance that means the world to me. It's a performance that transcends the boundaries of "performing", the actress merging with the character, and vice-versa. And on the heels of that accomplishment she seemed poised for stardom and appeared in Robert Altman's "Short Cuts" and in Terry Gilliam's "Twelve Monkeys". She was beautiful, sure, but more than that she was elegant. She had grace. As Elaine's brief nemesis Mrs. Landis noted on "Seinfeld": "You can't have a little grace. You either have grace or you don't." Madeleine Stowe had it. Her performances were often fierce, but she was always willing to let the characters demonstrate vulnerability. Off camera, she kept a low profile, was reclusive, seemingly adherent to a code only she understood (which would, perhaps, explain why she and Day Lewis had such staggering chemistry), and then for a 2 year period in the 90's she left acting altogether to focus on raising her children. It was totally noble and, thus, perhaps what did her in. That window in the movie business opens and shuts awful quick and I wonder if even such a brief hiatus left the window closed on Ms. Stowe. She returned in 1998 with "The Proposition", a film I remember being excited for due to her presence. It vanished quickly, as did the films which followed - "Impostor", "The General's Daughter." She surfaced again at the start of this decade as one of the Suffering Housewives in "We Were Soldiers" and then fell back off the grid. A look at her IMDB profile since leaves me heartbroken - nothing but titles of TV movies, "Octane", "Saving Milly" and a brief run on a TV show with Jeff Goldblum called "Raines" that I didn't even know existed. Currently she's filming a movie called "The Christmas Hope" for Lifetime. This? This is what it's come to for Cora Munro? She popped a musket ball in a mo-fo's face. She worked in the surgery. During The French & Indian War she told her father - a British colonel, mind you - that she might just have to support the French if his idea of "justice" was so convoluted. Yet, my judgements may be too harsh. I cannot assume to speak for her. In the documentary "Searching For Debra Winger" Rosanna Arquette attempted to determine why the renowned actress of the title up and left acting (before eventually returning) in the 90's. The film made it quite clear that good roles quickly diminished for actresses of a certain age - namely, above 40. Well, Madeleine Stowe would have turned 40....in 1998. Then again, when Arquette finally tracked down Winger she indicated her self imposed exile had less to do with quality parts than for a desire to live the parts of her life she had been missing because of the movies. This is a decision that demands respect. Maybe Madeleine Stowe made the same decision. Maybe she simply wanted to earn money in low profile movies to stay out of the spotlight and thereby keep focused much more on her family. But maybe not. It would seem we may never know the real answer. Nonetheless, as far as I'm concerned, her immortality has already been stamped. But someone still needed to say that the movies miss her. Today I was referred to your blog. I enjoyed this item and trust Ms Stowe is taking on the type and quantity of work she wants -- and that there's no ridiculous conspiracy involved! I presume you're very familiar with http://www.mohicanpress.com and Ms Stowe's wonderful interview at http://www.mohicanpress.com/stowe_interview.html !!! As to your article, the affect Cora/Madeleine had on you appears to approximate what Kathryn/Madeleine had on me in "12 Monkeys", the one she made before she "took her break". Her fate in LOTM was a far, far kinder one, however. If you're interested in knowing how her psychiatrist character "may" have turned out in "12 Monkeys", check out http://www.tempesta-tormenta.ca for my take on events. PLEASE give it until at least page 15! That's when she starts to turn things around.